Workers and activists marked May Day around the world Monday with defiant rallies and marches for better pay and working conditions. Police detained 70 people in Istanbul as they tried to march, garment workers in Cambodia defied a government ban to demand higher wages, and workers in Spain deplored the country’s 19 percent jobless rate. Thousands are expected to participate in large marches and demonstrations across the Western hemisphere Monday to observe May Day, also known as international workers day. “There’s a real galvanization of all the groups this year,” Fernanda Durand of CASA in Action told the paper. That group will lead a march of 10,000 people in Washington, D.C., to bring attention to immigrants’ rights. The Rise Up movement has organized 259 events in more than 200 cities, USA Today said. To find out how to get involved in your local May Day event visit Beyond the Moment, or Cosecha to see a complete list of May Day actions nationwide. Police arrest demonstrators as they march during May Day, in Istanbul, Monday, May 1, 2017. Security forces prevented leftist groups trying to reach city’s iconic Taksim Square to celebrate May Day. Police arrest demonstrators as they tried to march during May Day, in Istanbul, Monday, May 1, 2017. Protesters stands behind letters which reads in Turkish “NO” during a May day protest in Ankara, Turkey , Monday, May 1, 2017. Workers and activists marked May Day with defiant rallies and marches for better pay and working conditions Monday. Protesters hold banners during a May day protest in Ankara, Turkey , Monday, May 1, 2017. Workers and activists marked May Day with defiant rallies and marches for better pay and working conditions Monday. Protesters carry a banner during a May day protest in Ankara, Turkey , Monday, May 1, 2017. Workers and activists marked May Day with defiant rallies and marches for better pay and working conditions Monday. A protesters chant slogans during a May day protest in Ankara, Turkey , Monday, May 1, 2017. Workers and activists marked May Day with defiant rallies and marches for better pay and working conditions Monday. Detained protesters chant a slogan from inside a police in Istanbul, Monday, May 1, 2017. Police in Istanbul detained more than 70 people who tried to march to iconic Taksim Square in defiance of a ban on holding May Day events there. Workers and activists marked May Day with defiant rallies and marches for better pay and working conditions Monday. Protesters hold α banner and chant slogans during a May day protest in Ankara, Turkey , Monday, May 1, 2017. Workers and activists marked May Day with defiant rallies and marches for better pay and working conditions Monday. Cambodian garment workers wear headbands reading “Our rights” during a gathering to mark May Day at a blocked street near National Assembly in Phnom Penh, Cambodia, Monday, May 1, 2017. More than 1,000 workers staged a rally under a topic of “Living Wage Rights” and demanded a better working condition. North Korean workers take part in a tug of war as they celebrate May Day at the Pyongyang Thermal Power Complex in Pyongyang, North Korea, Monday, May 1, 2017. International Workers’ Day, which is also known as Labor Day in some countries, is being celebrated worldwide. North Korean workers cheer as they celebrate May Day at the Pyongyang Thermal Power Complex in Pyongyang, North Korea, Monday, May 1, 2017. International Workers’ Day, which is also known as Labor Day in some countries, is being celebrated worldwide. North Korean children perform at a celebration of May Day at the Pyongyang Thermal Power Complex in Pyongyang, North Korea, Monday, May 1, 2017. International Workers’ Day, which is also known as Labor Day in some countries, is being celebrated worldwide. North Korean workers celebrate May Day at the Pyongyang Thermal Power Complex in Pyongyang, North Korea, Monday, May 1, 2017. International Workers’ Day, which is also known as Labor Day in some countries, is being celebrated worldwide. North Korean workers, with their legs tied together, take part in a competition as they celebrate May Day at the Pyongyang Thermal Power Complex in Pyongyang, North Korea, Monday, May 1, 2017. International Workers’ Day, which is also known as Labor Day in some countries, is being celebrated worldwide. 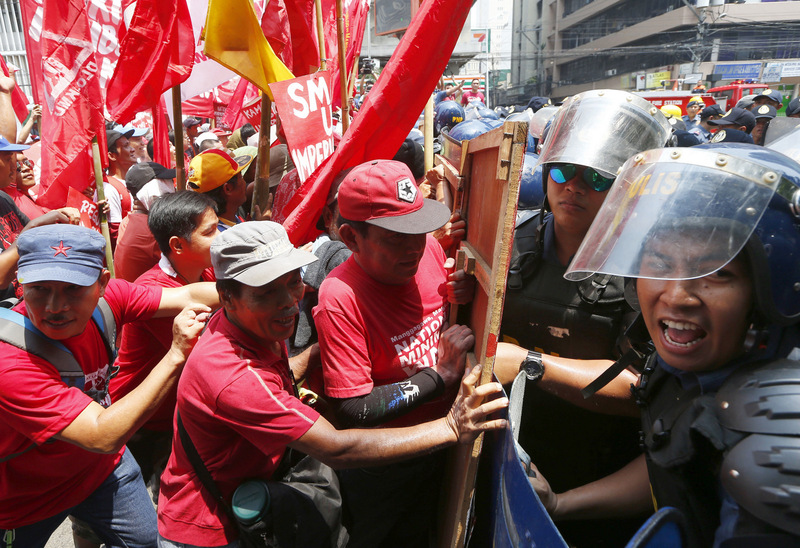 Protesters clash with riot police as they attempt to force their way closer to U.S. Embassy to mark May Day celebrations in Manila, Philippines, Monday, May 1, 2017. As in the past years, workers mark Labor Day with calls for higher wages and an end to the so-called “Endo” or contractualization. Bangladeshi garment workers shout slogans as they participate in a May Day rally in Dhaka, Bangladesh, Monday, May 1, 2017. Thousands of workers and activists marched during International Workers Day demanding higher wages and better work conditions. Bangladeshi workers and activists shout slogans as they participate in a May Day rally in Dhaka, Bangladesh, Monday, May 1, 2017. Thousands of workers and activists marched during International Workers’ Day demanding higher wages and better work conditions. Visitors, some with their children, walk past fences set on the tigers’ section at a zoo on the May Day holiday in Beijing, Monday, May 1, 2017. Millions of Chinese are taking advantage of the May Day holidays to visit popular tourist sites. Visitors are reflected on the protective glass as they watch the ring-tailed lemurs at a zoo on the May Day holiday in Beijing, Monday, May 1, 2017. Millions of Chinese are taking advantage of the May Day holidays to visit popular tourist sites. Workers carry a mock coffin and effigies during a May Day rally in Jakarta, Indonesia, Monday, May 1, 2017. Thousands of workers attended the rally urging the government to raise minimum wages, ban outsourcing practices, provide free health care and improve working condition for workers in the country. Participants of the traditional May Day celebrations, organized by the Austrian Social Democrats, SPOE, and trade unions walk with flags and banners in Vienna, Austria, Monday, May 1, 2017. All photos in this article are © Associated Press and were compiled by MintPress News.